The old town of Halstead, Essex, meaning ‘safe place’ or ‘place of refuge’ in Old English, was the site of this job. Similarly, historic is the property I was called to, a fantastic seventeenth century thatched cottage, situated just on the outskirts of the town. The owner was keen to have her Terracottatiled living room restored; the tiles had been laid twenty years prior and had been given very little treatment over the following two decades. They were now very dirty and dull looking and were certainly in need of a deep clean, followed by the application of a fresh seal to maintain condition. 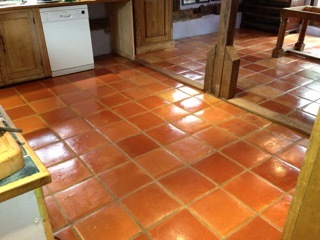 To begin the cleaning process, Tile Doctor Pro-Clean, a heavy duty, high alkaline product designed for cleaning Terracotta and many other types of natural stone, was applied liberally to the floor in a dilute form. The product was then left to dwell for a short period, allowing it to seep into the pores of the stone, before being scrubbed into the tiles using a rotary machine fitted with a black scrubbing pad. The grout lines should usually be treated individually in the cleaning process since the dirt and stains found here can prove very stubborn, and so they were scrubbed carefully with a special grout brush. Following this a high pressure spinning tool, which is powered by a machine in my van, was used to blast stubborn ingrained soils from the grout and tile. This tool also serves to rinse the tiles and vacuum all slurry and chemicals back into a waste tank on the van. 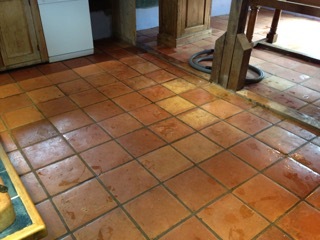 The floor was then left to dry fully overnight, allowing for any excess moisture to disappear and leaving the tiles ready to be sealed the following day. In the morning I arrived back at the property and promptly for any dampness. Once satisfied with the condition of the tiles, I proceeded to apply Tile Doctor Seal and Go. This is an odourless, water-based topical sealer that builds up protection on the surface of the tiles, providing a durable and aesthetically pleasing satin finish. Since Terracotta is a very porous material, I was required to apply five coats of the sealer, allowing enough to fill the pores completely to offer protection from within. The results of the restoration were very pleasing for both the customer and myself. I think you will agree that the floor no longer looks like it hasn’t been cleaned for twenty years – in fact, it looks almost brand new!